Recommended default initial field alarm and trip settings are now referenced in ANSI/HI 9.6.5 Rotodynamic Pumps – Guideline for Condition Monitoring. New content on vibration criteria at the top of the motor for vertical pumps. Solids-handling pumps with single-vane impellers excluded in the scope of the standard. Tri-axial anvil mount removed from permanent rigid mount of transducer recommendations. VS2 icon updated in Figure 9.6.4.2.3.1. 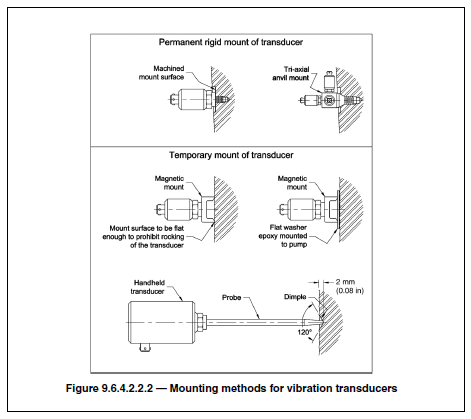 New content on managing vibration of vertical structures recommendations. Scope of Standard: ANSI/HI 9.6.4 pertains to evaluation of vibration when the vibration measurements are made on stationary parts associated with bearings (bearing housings) of rotodynamic pumps. It provides specific maximum allowable vibration values measured on bearing housings of rotodynamic pumps in field and factory test environments. 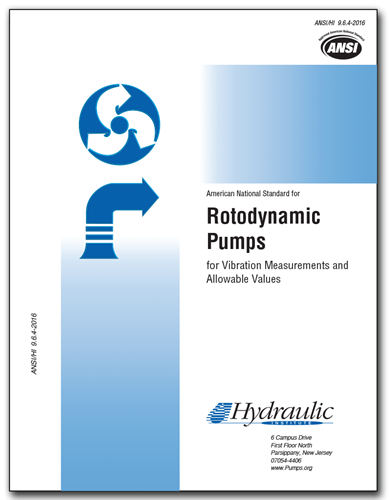 This standard applies to the evaluation of vibration on rotodynamic pump applications absorbing more than 2 kW (3 hp). Applicable Markets: This standard applies to all markets worldwide. Click the "More Details" tab above for additional product information. Content: Bearing housing vibration measurement, speeds above and below 600 rpm, vibration measurement instrumentation, vibration acceptance performance for field and factory tests, acceptance test installation and operating conditions, allowable pump bearing housing vibration, suggested vibration test report, factors affecting vibration, vibration criteria at the top of the motor for vertical pumps. Who Should Buy This Standard: Specifiers, consulting engineers, and end users involved in pump factory or field testing. This standard is available for immediate download in secure PDF format. Standards in this format are a single-user license and are encrypted for security purposes. Each standard is authorized to a single login and password on a single desktop or laptop computer. The end-user license prohibits installation of these files on a network server or their shared use in an network environment. These files may be transferred from an old computer to a new computer by following the instructions provided upon purchase or available online at estore.pumps.org/about.aspx. To view HI Standards in this format requires the download of the free Adobe® Reader®. Authorization requires download of an Adobe-approved plug-in from FileOpen Systems, Inc. and Internet access to complete the authorization process. Security permissions of these files allow printing and the addition of comments. Once authorized these files may be accessed with or without connection to the Internet.